Gelineau and King’s A Reaper of Stone Is The Start of Something Astonishing. Warning: A Reaper of Stone is highly addictive. Make room on your calendars, cancel appointments, find a dog sitter because, once you realize there are more novellas by Gelineau and King, you will not be able to physically stop yourself from reading them. To say I’m very selective of my fantasy reading is a bit of an understatement. As is often the case nowadays, fantasy series are frequently sweeping epics with publication dates spanning years, if not decades (I’m looking squarely at you George R. R. Martin). With a cast of thousands and story arcs that are more intricate than a trigonometry class book written in Klingon, these epics demand my full attention so much so that I often forsake all other series in the hopes of not confusing plot-lines or characters. Then there are those epics that begin wonderfully, but after many years the writing declines and you merely stay along for the ride just to get a sense of fulfillment only to have the author pass away before the tale is finished. True story. 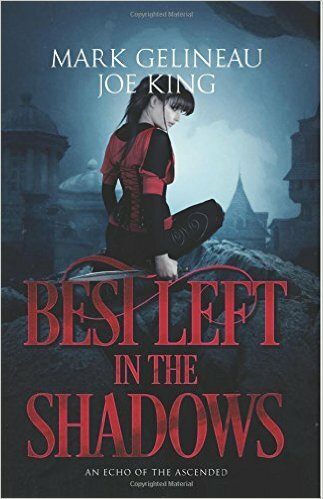 I received a request a few moths back from Mark Gelineau and Joe King to review their novella Best Left in the Shadows. 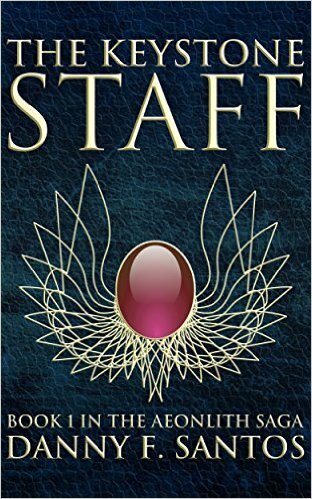 At the time I was still wary of attempting to start another fantasy series (being currently embedded in a popular one) that I promised to promote their novel in my Astounding Authors feature and call it a day. Later, while looking for a short novel to review while on vacation, I came across the novella A Reaper of Stone by Gelineau and King on the Net Galley site. (Disclaimer: I received a free copy of this novella in exchange for a fair and honest review.) The first thing I noticed was that it’s part of the Echoes of the Ascended world, as was Best Left in the Shadows. But it wasn’t until I read that the authors had a plan to publish a new novella each month set in the world of Aedaron that I came to realize the utter brilliance of these stories. 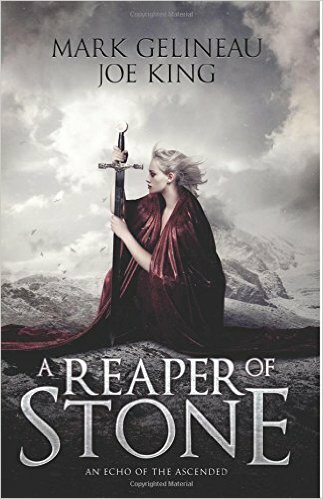 A Reaper of Stone, centered around Elinor – strong, confident heroine who is a Reaper in the land of Aedaron – is mesmerizing. The old world has passed and the inhabitants of Aedaron have decided that the world must move on – all keeps of the old world must fall. But in doing so, they’ve lost their connection to the old gods, the old heroes. The world Gelineau and King created is deep and rich. They seem to draw from the best of fantasy: a dash of magic, a pinch of politics, and a whole lot of just waiting to be revealed history. Very much like a dealer, Gelineau and King are giving us just enough of this world to keep us hooked for the near future. No five year waits for the next novel. No complicated plot lines that require a wikipedia page. Just five stories published in a (for now) timely fashion. Just what I needed to keep my fantasy fix going strong. A Reaper of Stone is suitable for young adult readers of fantasy and adults that are looking for an inventive, engrossing plot lines and captivating characters. Next week I’ll continue the review with #2 in this particular series: Broken Banners. I definitely have more to say. Till then, I highly recommend CLICKING HERE and downloading A Reaper of Stone. Then, after reading it, forward this review to family and friends and get THEM to read Gelineau and King. But when you find yourself skipping your favorite TV show, avoiding sleep or not walking the dog just to keep reading the next story, don’t say I didn’t warn you. What Lies Beneath The Surface’s End? A Good Parable. Jonah Whitfield lives in a small farming village near the Deathlands, a strange desert in the middle of a lush and green landscape. The inhabitants of his village live a pastoral life, one free of excess, electronics and sloth. Hard work is valued, family life is cherished and citizens strive for a strong sense of community. But the land holds many secrets. Rusting mechanical machines litter a nearby junkyard. Tools and homes are crafted from the remnants of objects whose original uses are lost to time. One day, while hunting, Jonah explores the forbidden Deathlands area only to find a passageway to a hidden complex, a series of tunnels filled with glowing lights, working machines…and the voices of other humans. Here he finds questions that may very shake his view of the world. 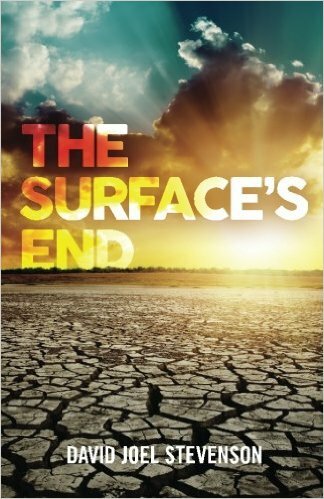 Thus begins David Joel Stevenson’s Young Adult (YA) Dystopian novel, The Surface’s End. I have to say this was a welcoming and pleasant surprise, if not a bit formulaic. The YA and Dystopian novel market is booming, helped in part from the success of The Hunger Games, and the self-published sensation Wool. It seems we all can’t quite get enough of a futuristic world filled with crushing authority, bleak lives and young protagonists that offer a glimmer of hope for a better future. I know I can’t. I practically thrive on it. Stevenson turns the tables on the basic dystopian formula by starting off in a quite comfortable place where residents have found a bit peace after what appears to have been a time of violence many generations past. History is forgotten, but not altogether gone. The shells of the former world litter the landscape, raising questions for those brave enough to ask. Only after Jonah discovers a hidden world do we begin to see a society living in a questionable future, a future filled with laziness, lack of values and systematic separation of classes. A future that looks surprisingly like our own present. The author did a fine job of building the mystery in the first half of the novel. Unfortunately, the second half fell into the trap of revealing too much information too fast. While I have no doubt Stevenson has more to tell of what lies beneath the Deathlands, revelations seemed to come faster than expected. The fun is in the build-up! I like my dystopian stories dripping with dispair and a protagonist that struggles with a world that makes little sense. There is also a not-so-subtle message that Stevenson is trying to convey to the reader – a philosophy of hard work, good values and unquestioning loyalty to family and community. But here too, the delivery is a blunt object over the head. Stevenson needs to trust the reader to make their own conclusions to the message he’s sending. That aside, this was a quick, enjoyable page-turning read. The author provided me with a review copy of this novel in exchange for a fair and honest review. My foray into the world of first time authors and self-published novels from up-and-coming independent writers, continues to be a welcomed experience. Finding a small jewel like this in the stacks of requests is what makes my hobby of book reviewing so enjoyable. The Surface’s End was engaging, creative and hopping with energy. The author has a clean and tight writing style that is effective and affective. Readers will eagerly want to learn what comes next. I know I do. But let the mystery build a little slower next time, ok? Three Stars out of Five. A good, enjoyable novel that you will not be disappointed in reading. To read The Surface’s End, pick up a copy by CLICKING HERE. When you are done, head on back here to Astounding Books and let us know what you thought! We have a great selection this week! This installment of Astounding Authors features a fantasy crime noir, a sci-fi action adventure, a dystopian tale and more. Support our Astounding Authors by reading one of these exciting novels today. 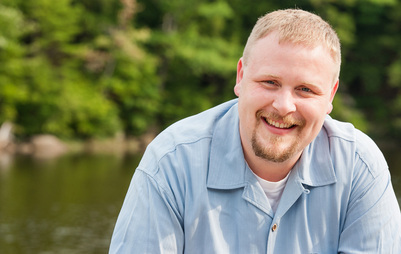 Stop by our Facebook page and let your friends and family know you found an exciting new author on Astounding Books! The body of a Highside girl is found dead in Lowside, beaten and murdered. Daxton Ellis, Magistrate Inspector, and friend to the girl’s noble family, comes to find answers. He knows the doors of the underworld open only to its own kind. His only hope lies with an old lover, Alys, a daughter of the underworld gangs, and the one person he swore he would never see again. 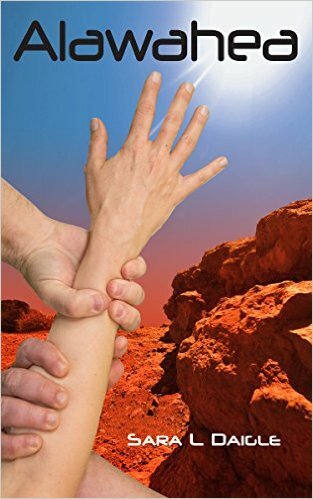 She agrees to help him, but for a price. First they must gain the approval of Blacktide Harry, the boss of Prion and the king of rats. 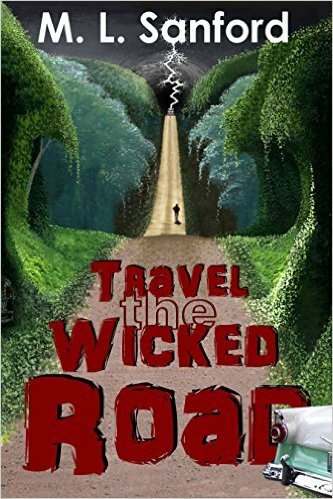 Then, deeper they go, traveling into the dark heart of the underworld in search of a killer. Like everything in Lowside, nothing is as it first appears, and everything has a price. Interested? Click here to read Best Left in the Shadows and support our Astounding Authors! Violina, a girl polarized by love and loathing, finds herself thrown into a post-apocalyptic world with mankind on the brink of extinction. 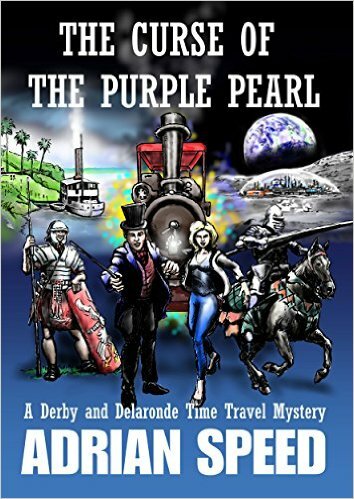 Discovering the means to travel back in time, she sets out to save the world by preventing the events leading up to the apocalypse. But as her quest advances, she becomes increasingly disgusted by the evil inherent to humanity and seeks lethal justice against all who wrong her—a list that grows exponentially until it encompasses all of mankind. By the end of her crusade, she realizes the future cannot be changed, and it was she who brought about the apocalypse in the first place. You can purchase a copy of Inevitable Ascension here! In the near future, wealthy “patricians” access the internet through a chip embedded within their flesh, while scavengers eke out a meager existence in the slums that surround their walled cities. All technology that is not approved by the company running this network, known as the “bionet,” has been banned, so scavengers live off the grid. A teen scavenger named Clark finds an illegal laptop and befriends a fellow scavenger named Starla who gives him access to a power supply. Together they learn how to hack into the bionet, but in doing so, Clark is intercepted by agents working for the CEO of the mega-corporation that runs the network. Impressed with Clark’s brilliance, he offers to make Clark a patrician. The operation to insert a biochip will wipe out Clark’s memories of Starla. Clark must choose between remaining a scavenger and becoming a patrician, between freedom and wealth, between Starla and absolute power. When the plan Clark hatches to have it both ways goes awry he finds himself in a fight for his life against the world’s largest corporation and its CEO. 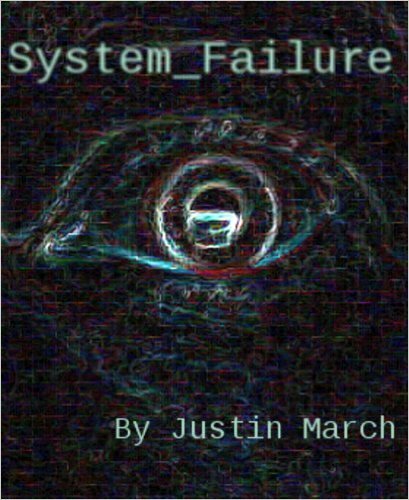 Read System_Failure! Click here to purchase. The year is 2116. Millions of American and European refugees run from the destruction of the war-torn Northern hemisphere and flood into Megasampa, the urban sprawl formed by the combined metropolitan areas of Sao Paulo and Rio de Janeiro. They gather in the Novo Bronx ghetto, a place of vice, death and hardship, but also of refugees just trying to rebuild their lives. Novo Bronx was never a quiet place by a long shot, but now unrest grows as a series of macabre murders strike fear into the heart of the populace. Murders attributed to a creature the locals are calling Bebê Diabo, the Devil Baby. The Proctech private police quells the rebellion for the time being, but the gruesome deaths are unlike anything they have ever encountered. Reluctantly, they call out of retirement the only detective insane enough to solve an insane case. 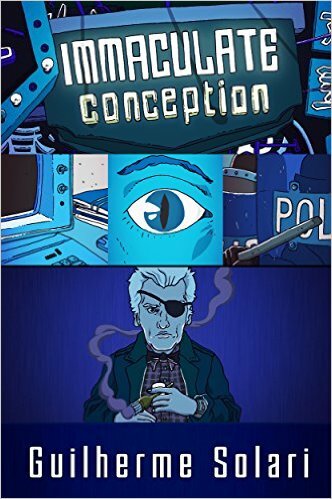 IMMACULATE CONCEPTION is the first book in the CYBERSAMPA series. Your door to Immaculate Conception starts here! Click to purchase a copy. Thanks for stopping by this week. Stop on over to our Facebook page and let us know what you thought. Welcome to a new year of Astounding Authors. Check out this week’s offerings from exciting and new independent writers. Don’t forget to come back later and tell us how you enjoyed it. Please tell your family and friends about us. Now to this week’s Astounding Authors! But finding the answer only presents Ben with a whole new batch of problems. Does he use what he learns to put his life back on track? Or will he be compelled to do the right thing, even if it leaves his life a mess? 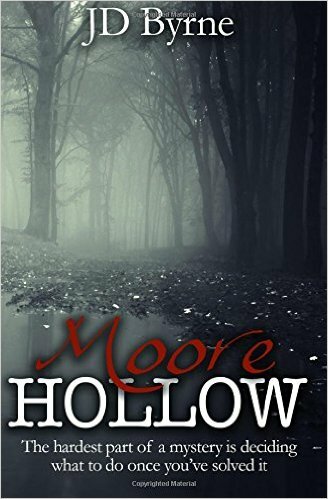 Click here to learn more about Moore Hollow. Acclaimed Abstract artist Sun Yat Pill has just had his most successful Gallery opening. After the exhibition, he goes home and retrieves the painting he has been working on for the last 2 years, his masterpiece, ‘The St. Matthew’. With painting in hand, he takes the subway to the South Bronx. On a deserted ghetto block, he leaves ‘The St. Matthew’ in the backseat of an abandoned, rusted Volkswagen Bug. With his mission accomplished, he returns home and promptly hangs himself, committing suicide. Where is ‘The St. Matthew’ and why did Pill take his own life? As these questions grow in the media, a Basquiat Bounce begins to creep into play. The Basquiat Bounce is a novel that highlights the talent and absurdities of the contemporary art world. A business where Terence Koh’s ‘Dialectic’ (A dried turd wrapped in gold foil) or Mark Kostabi (Who has his assistants paint for him) can command hundreds of thousands of dollars and have solo exhibitions around the globe. Through its cast of eccentric characters, The Basquiat Bounce tries to make sense of this industry in an often hilarious and always entertaining fashion. 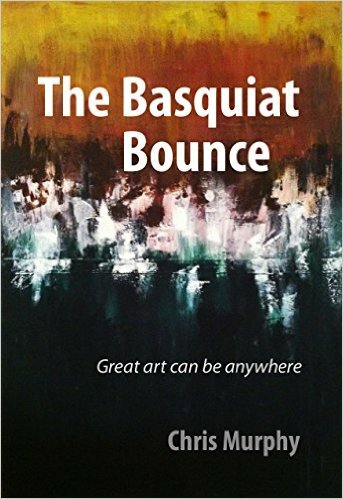 Click here to purchase Basquiat Bounce by Chris Murphy. 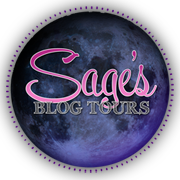 Click here to read.Alawahea: The Azellian Affairs, Book One by Sara Daigle. That will do it for this week. Be sure to Like the Astounding Books Facebook page so you won’t miss any updates. I have to say this is one of the best surprises I’ve read this year. I’m a sucker for a good post-apocalyptic / dystopian story, so it’s no surprise Floor 21 by Jason Luthor hooked me from the start. 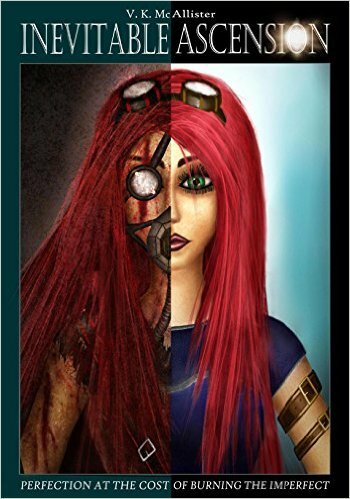 Jackie is a curious, independent and headstrong 17 year old female living in one of the top floors of a Tower that is besieged by a black, oozing muscle-like mass that reacts to pain and emotions. Everything below Floor 21 is unlivable. The higher you live, the better the conditions. Jackie lives on Floor 4. No one knows or remembers before the Creep infested their massive tower, or what lies below or beyond. Questions and inquisitiveness is frowned upon by the secretive and reclusive Authority who live on Floor 1. Follow the rules and everything is fine. Except everything isn’t fine. No one talks about the Creep. Jackie’s parents are acting weird. People disappear; some return acting different after going through Reinforcement. When Jackie begins to ask questions, the answers she seeks might just bring the whole tower down around them. 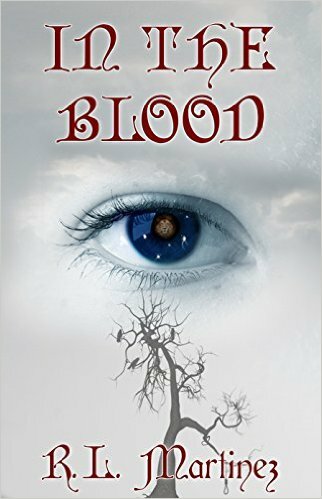 Jason Luthor crafts a compelling, fast paced, mysterious story that creeps up while you are reading. (See what I did there?) At only 144 pages, it’s a short read that seemed like a prologue to a much larger adventure. The author uses recordings of monologues made by Jackie as a narrative device to tell her story. Halfway through the novel the recordings switch from Jackie to that of a Commander on a Scavenging team, instructed to go below Floor 21 and look for food, materials and any secrets that may unlock the reason the Creep came to the tower. Luthor expertly manages the release of information that explains the backstory of the Tower. I like that. New information is introduced in a matter-of-fact way and I never felt at a loss. [(Except for the steaks. Like, seriously…Where do the steaks come from? It’s not Creep Meat is it? Gross!) in my best 17 year old voice]. He also doesn’t give away the farm. There is obviously more to the story and that’s the sign of good world building. It’s often hard to get a good deep look at the secondary characters of a novel when the narrator is “recording” their actions. These important characters often come across as one dimensional or cardboard-like. Also, I think Luthor had to explain a few times how Jackie was actually recording given what she was doing. Jackie’s use of modern slang was a bit distracting. The events of the novel are set decades or centuries in the future. Her dialogue just didn’t come across as that of a 17 year old girl; maybe 14 years old. Of course it’s been a while since I was a teenager so who knows. The ending felt a bit rushed, but the plot wrapped up nicely, paving the way for the next installment in the series. (There will be a next installment right?) It’s certainly not a stand-alone novel. All-in-all this had the feel of a very good novel in the Young Adult category. NOT THAT THERE IS ANYTHING WRONG WITH THAT. Personally? I think there are some fantastic YA novels out there today that I wish were around in my time. My point being, while it’s not deep-thought science fiction, it’s light enough to hook the most adamant of sci-fi fans, while appealing to a much broader audience. 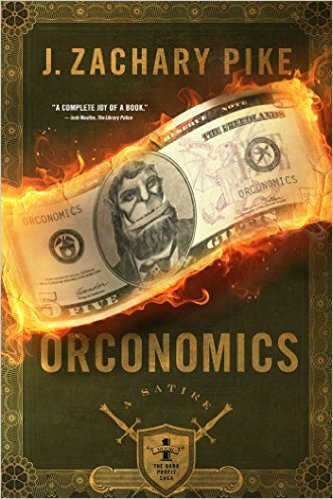 I received a copy of this novel from the author in exchange for a fair and honest review. I’m thankful to have had the opportunity to read and review this novel and look forward to more stories from Jason Luthor. Floor 21 is a wonderful start to what looks like a promising series. Discover a new indie author today. Head on over HERE and pick yourself up a copy. 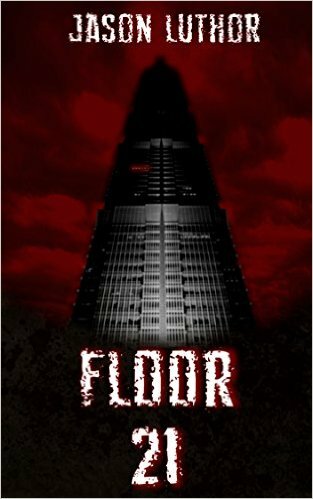 At 144 pages, Floor 21 is a quick, enjoyable read that I know you will appreciate.